Android provides different methods to block our devices, from a simple lateral movement until passwords or facial recognition. 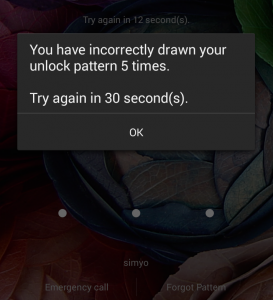 However, one of the most used methods consists on setting an unlock pattern. This pattern results from the union of a certain number of points on a grid following a specific order. It is a moderately fast and secure locking method, as it allows quick access to the phone and prevents the screen to be activated by mistake. It is not as secure as a password, because the number of combinations to connect the dots in a small grid is not very high, so it is not impossible to guess. 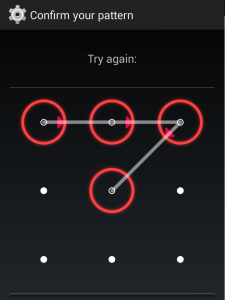 To configure our tablet or phone to use an unlock pattern is simple. In fact it is so simple that our son can surprises us by pick up the phone, setting a pattern and forget which one, so that we will have a blocked phone without any access to it. If we are in this situation, we have several options before despair. If we have internet access and a gmail account, the task becomes very simple. We just need to enter the wrong code 3 or 4 times (depending on device) and we will get a message saying that we have to wait 30 seconds before trying again. Also, at the bottom of the screen, it asks if we have forgotten the pattern. If we mark this option, we will ask the mail and password to the account linked to the phone and within seconds we will have it unlocked. If we do not have internet connection or the device linked to any Google account, things get a little tricky. The most practical solution would be to wait for the internet access, but this is not always possible. If the problem is that we haven’t the device linked to an account, there is a trick to access once to the phone and make the link. For that, we need another phone. From any other device we can call ours and if we respond to the call, it automatically unlocks. Now we can make the link with gmail and repeat the previous point to unlock it. This is a handy trick if it is a phone, although in the case of most tablets it doesn’t work. In that case we must resort to more drastic methods, which involve erase and install some files. The “less aggressive” approach is to delete the file that stores the pattern, so that when we restart the phone it boots unlocked. This method works on many devices, but we need to meet two requirements: the device must be rooted and we need the USB debugging mode enabled. With this, we can delete the file and remove the pattern without having to delete the files stored on the device, no matter it’s a phone or a tablet. If none of that has worked for us, we have to move to a “more aggressive” approach, which is consists on reset the device and simultaneously save our data. Tomorrow we will tell you step by step how to perform both actions.